Yesterday was seasonably warm. I almost typed unseasonably, because just a few days ago I was mulling over whether I should buy one more sweater this season or if I could wait. Let us all hope and pray that, with Beltane just 3 days away, we are finally - FINALLY - out of winter. But, it is the end of April and beginning of May and that makes it seasonably warm to be in the upper 60s. I was sitting on a bench outside of my store enjoying the sunshine for the first time this year, and I wrote a poem. Now, a bit of me wants to make some sort of significance about the subject of that poem and the fact that Partner's family experienced a loss yesterday around the same time I was writing. But, we all know where my head has been lately, so this poem should come as no surprise. I've been writing a lot more lately, but this one I liked. At the bottom of the poem is a movie about witches. So, stick around. The poem is called 'Bubbles are people'. pier in New England somewhere. 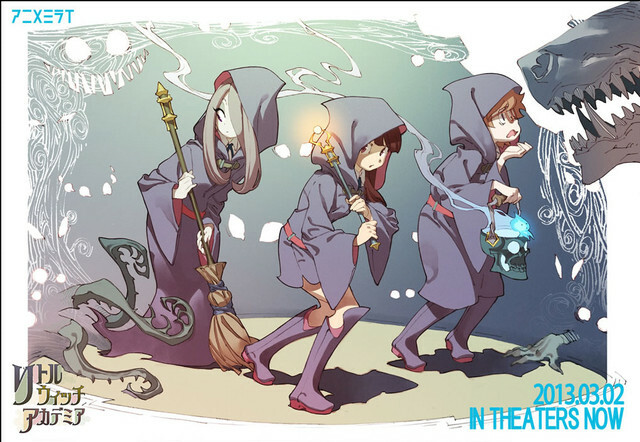 I stumbled across the most adorable little short film called Little Witch Academia this past week. I kept it in my cloud reader for the past several days, because I just never found the time and blah blah blah. I finally watched it last night, and it is adorable. And, here's the best part, you can watch it in its entirety at the bottom of this blog post! I KNOW!!! The film is part of a Japanese government project called Anime Mirai, or the Young Animator Training Project, funded by the Agency for Cultural Affairs. Though it is only a one-shot, many people around the internet are hoping and praying this somehow gets picked up for a full series. It is delightful, if squarely in the realm of Anime that has been derived from more western ideas - Harry Potter, chief amongst them. Despite any shortcomings, of which there are few if any, you can watch the whole bow-slinging, spell casting, wand waving, dragon hunting, Sorcerer Stone saving, bippity boppity boo-ness of the 26-minute short film/let's hope it eventually gets called the 'pilot episode'. I love it! And a part of me always does a happy dance when I see that you've blogged or podcasted. So sorry for Partner and family. I'll light a candle for all of you.